On the hunt for the best spiralizer? We've tried and tested a bunch of spiralizers here at Real Homes, and we've curated a list of the very best ones to add to your kitchen cabinet. Spiralizing your veggies is an easy way to help you eat your five a day, and it can jazz up an otherwise pretty plain dinner, so why not invest in one? For more kitchen appliance recommendations, head to our appliances hub page. If you're after a basic spiralizer to make noodles or zoodles, then you won't need to worry about having more than one blade. However, if you're thinking of experimenting with your spiralizer, it's worth getting a one that has all sorts of blades to choose from so you can have ultra thin zoodles or super thick ones, or even ribbons. Spiralizers can be a nightmare to clean, because they comprise of several parts. Opt for one which is dishwasher-friendly to make your life easier. Spiralizers are either electric or manual, the former being the easier to use, but the latter being easier to fit larger fruit and veg in (such as apples and butternut squash). With most electric spiralizers, you may have to cut your fruit and veg in half first. Your search for the best spiralizer you can buy ends here, with the Lakeland Easy-Store Spiralizer. Featuring four interchangeable blades for different creations, a rotary handle to make it easy to spiral hard vegetables, and suction feet to hold it securely in place on your worktop, the possibilities with this spiralizer are endless. Although it's made up of quite a few parts, once you're finished using the machine they can all be washed in the dishwasher and stored inside the machine thanks to its innovative design. Be sure to press the machine down when using and bear in mind that a little pressure goes a long way. If you're after a cheap yet still cheerful spiralizer, this is your best option. It's easy to use and clean, and the best part is that it has five blades to choose from so you can spiralize to your heart's content. The machine itself is also BPA free and dishwasher safe. The best spiralizer for students and those after something easy and affordable, we think. Thanks to electric spiralizers, it has never been easier to join the spiralizing trend. 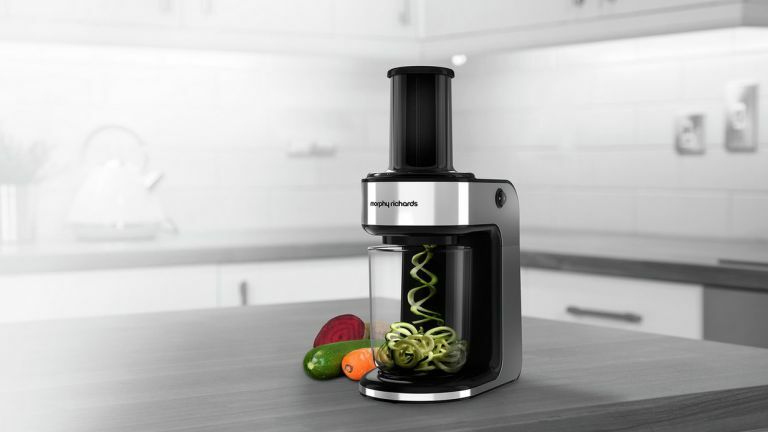 The electric Spiralizer Express from Morphy Richards is extremely quick and easy to use. It features one speed setting, so you simply pop your veg in the tube to be spiralized; it also comes with two blades, one for spaghetti and one for wider ribbons. Once you're finished, the machine has removable parts that are easy to clean and dishwasher safe, and for those who don't want it on display, it's easy to store as all parts can be placed inside the unit and the power lead retracts into the base. Our only complaint is that larger veg such as butternut squash and some apples may not fit in the tube, so they'll need to be cut beforehand, but all in all, this is the best electric spiralizer you can buy. Small enough to fit in a drawer, yet still more than capable of doing a good job, this handheld spiralizer is the best option for those who don't have much room in their kitchen. Essentially, it does the same job as all the other spiralizers, it just requires more work on your behalf. It's ideal for making smaller quantities, or for those who live on their own; to use you simply attach your courgette, carrot or cucumber to the blade then twist and turn the grip handle. Once you're done, there'll be little washing up to do too, as the unit itself is smaller than most. The best handheld spiralizer on the market, we think. It may only have two blades, but for those who don't like the faff of assembling kitchen appliances, this is ideal. Made from black enamelled heavy-duty stainless steal, the ProCook Spiralizer is built to last, and it features non-slip suction cups on its feet to keep it in place on your worktop. Although not dishwasher safe, it's still easy to clean in the sink because it's not a complex piece of kit. If you're after something with no-frills, this is the best spiralizer for you.